What a great party! This past Saturday, January 19th marked the celebration of Falcon Structures’ 10th anniversary. The past decade saw tremendous growth for our company and it could not be possible without our staff of Boxperts. We have grown from a company of a few in 2003 to a staff of 70 in 2013. We recognize everyone as an equal and integral part of our company. While some individuals span almost a decade of service and others have come to us just recently, we celebrated each of them this past Saturday. We began the tradition of the Golden Container Awards as an annual award event recognizing the individual contribution of our employees to Falcon’s success. We have been blessed with a staff that continues to put the service of our clients before themselves and who do an outstanding job with every order filled and conex box delivered. With 2012 marking the year of the largest staff since our inception, we were proud to welcome 24 new individuals to the Falcon Structures family. These new staff members filled roles in fabrication, production and office personnel. 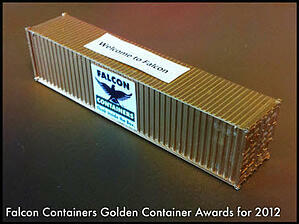 We awarded the Welcome to Falcon Golden Container Award to each new Boxpert. My partner, Brian Deringer, and I strive to connect to our employees to ensure our awareness of their impact by allowing each of them the ability to contribute input and leadership in their roles. We took some time in preparing the awards this year and I would like to highlight a few or our employees and their recognized contribution. Bobbi Giblin, Office Manager - The Angel Award. Recognized for extending compassion to personnel and clients during challenging times. Diana Miller, Purchasing - The Greatest Loyalty Award. Recognized for being the longest term employee at Falcon Containers with seven years of service. Bill Allen, CFO - G.O.S.T. Man Award (Get our Stuff Together). Recognized for tremendous impact in pulling together the financials for Falcon Structures. James Portillo, Paintshop - The John Gotti Award. Recognized for stellar leadership on client projects in the paint shop. Kay Johnson, Accounting - The Notebook Award. Recognized for recording EVERYTHING and taking the most copious notes of any Boxpert. It is with great pleasure and great fun that we awarded these and other awards to a great staff of individuals who we are proud to call our Falcon Structures Boxperts. We want to thank each of them for their tremendous contribution to our success. For more information on Falcon Structures 10th Anniversary and some history on our company, refer to our press release on our recent celebration.